Light Needs: Medium to high indirect light. Fluorescent lights work well if there is no access to regular light. They will bloom best if they receive 10-12 hours of light per day. Best Temperatures: They do best in a warm environment with stable conditions. Water and Humidity Needs: Allow the soil dry out between watering and avoid getting water directly on the leaves. It is best to water from the bottom of the pot up. Do not let them stand in water for more than twenty minutes. Growing Guidelines: Use an African violet mix in shallow pots and repot them every year. Fertilize twice a month in the spring and summer with an African violet fertilizer. Keep leaves dust free. Common Problems: Mealybugs and aphids. If the soil is too dry, the temperature is too high, or there is not enough light, the plant may have a lack of flowers. Avoid using cold water because it will cause spots on the leaves. Propagation: Leaf cuttings and plant the leaf with its stem in a moist but loose medium. Fun Facts: Saintpaulias, commonly known as African violets, are a genus of 6–20 species of herbaceous perennial flowering plants in the family Gesneriaceae, native to Tanzania and adjacent southeastern Kenya in eastern tropical Africa. The scientific name Saintpaulia was named after Baron Walter von Saint Paul, the man who discovered the plant in 1892. It is one of the most popular houseplants in the world and since it is easy to grow is also a great plant for beginners. 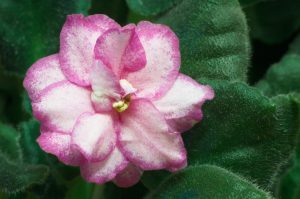 In many cultures, the African violet is a traditional gift given to mothers for Mother’s Day. As abundant as they are as cultivated plants, several of the native species are considered endangered or threatened, due to deforestation. The hairs on the leaves helps the African violet absorb water from the air.